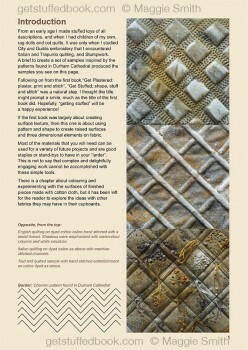 Get Stuffed: Shape, Stuff and Stitch presents a fresh approach to quilt and applique techniques, featuring 24 pages of inspiring samples and practical advice to inspire both beginner and experienced maker alike. Several pages have useful patterns like this page’s Chevron pattern. Stuffing is used in its widest sense, and you’re encouraged to mix traditional techniques like English, Italian, and Trapunto quilting, with unconventional stuffing material, like washers, wire and cotton balls. From textured, raised pattern, dimpled with exquisite stitches, painted and varnished surfaces using mixed media, to three dimensional stuffed birds and characterful dolls, the book will delight and encourage you to get started creating for practical and decorative purposes. 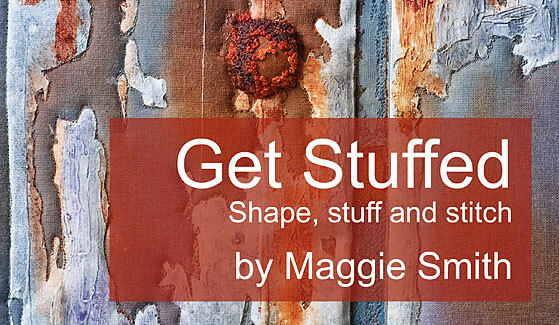 Currently Get Stuffed is available online via Amazon Marketplace. We hope to have a simple webshop up-and-running in the next few weeks. You can also now order Get stuffed from our newly opened online shop, for £9.95 including free UK delivery.